I've made no bones about my disdain for the summer movie schedule of 2010. The writer's strike of a couple years ago finally caught up to us my fellow movie freaks and me. 2009 was a banner year (hence The Summer of the Nerd) and both 2011 and 2012 look to be legendary and chock full of nerdy goodness. Sandwiched right there in the near middle, though, is 2010, the gay red headed stepson of a wealthy Republican family from the Northeast. It's absolutely embarrassing. So on the Friday before Memorial Day, the third biggest traditional movie weekend behind only Christmas and July 4th (which I'll have a HUGE rant on), I found myself wanting for movie options and sitting in for "Shrek Forever After," a show I wasn't all that excited about. 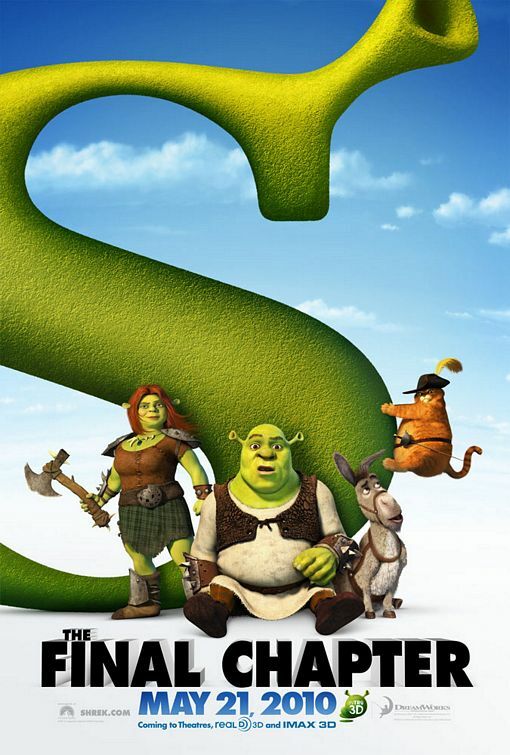 "Shrek" picks us up in the middle of the title characters mid-life crisis. Maybe crisis is the wrong word. Rather, the middle of his suburban rut. Every day it's the same thing and that is starting to wear on everyone's favorite surly ogre. After blowing up at his kid's birthday party, Shrek stumbles into the path of one Rumpelstiltskin who has an axe to grind with the Shrek. Stiltskin tricks Shrek into signing a magical contract that will give the ogre one day to be an ogre, complete with rampaging through the countryside and striking fear into the hearts of villagers. When Shrek nears the end of his day of fun, however, he discovers that the fine print of the contract has virtually stripped him of his existence. His wife, Fiona, and friends don't know who he is and Stiltskin is now the king of Far Far Away. At the end of the day Shrek will vanish forever unless he can again experience "love's first kiss" with Fiona. “Shrek” has always been a bit of inconsistent for me. The first one was decent enough, though I think it's quite overrated. I very much enjoy the second installment and find it quite funny every time I watch. The third film, however, is awful. No laughs, no plot, no writing of any substance. The wit of the first two is completely absent from the third film and it soured me on the franchise as a whole. "Shrek Forever After," though, pleasantly surprised me. From the beginning, it is clear to the audience that everyone behind this film recognizes the failure of the third film and its lackluster departure from the style of its predecessors. The story, while far from original, is much livelier than the third “Shrek 3” ever was. (Though to be honest the third “Shrek” seemed like it was mapped out by an 8 year old with a hangover up against a deadline.) Laughter is again a part of the “Shrek” universe here while it was painfully absent before. Some of (okay, maybe most of) the laughs are predictable and easy, but not so easy as to make me feel dumb for laughing. Perhaps I was just happy to take what I could get on a weekend when the only other options involved Jake Gyllenhaal or four rich women complaining for 150 minutes. For me the real difference between “Shrek 3” and “Forever After” is the voicing. For one thing, “3” was overfilled with cameo voices that swallowed up too much of the script. I’m a huge fan of the well placed cameo but when you pile them on one after the other, they begin to take away from the actual cast. “Forever After” doesn’t fall into that trap. There are still a lot of extra recognizable voices but they work with the main cast instead of fighting against them. More importantly, though, the headliners feel more invested this time around than they have before. In “Shrek 3” all of the voice talents sound bored and unconcerned. This time around Mike Myers, Eddie Murphy, Cameron Diaz, and the rest are actually trying. Maybe that’s because they all hate “Shrek 3” like the rest of the world does or maybe it’s just that they have something to work with this time that they didn’t before. Or maybe it’s that they need this one to be good. Myers and Murphy in particular are in desperate need of a hit. Myers is bordering on dropping into Straight-to-DVD Hell after the disastrous turn his career has taken over the last few years and Murphy isn’t far behind. Even though it’s only voice work, you can sense a bit of urgency in both of their performances and “Forever After” is better for it. “Forever After” is far from flawless. As I mentioned, it’s not so original, playing out a bit like “It’s a Wonderful Life with Ogres.” I wasn’t just overrun with the need to laugh out loud, either, which would have been a welcome distraction to the 3 year old sitting behind me, kicking my chair repeatedly. And if nothing else, I’m still not convinced that either of the movies that followed “Shrek 2” needed to be made or that there’s a story here that needs to be told. Still, this movie is a bit of summer fun in a year that DESPERATELY needs it and a solid final chapter to the franchise.